Update: Well that was a timely post. Last week, the week of October 8 2018, saw the S&P 500 drop a little over 4%. While not exactly bear market territory, the pundits are already out in force declaring the end of the bull market and to move your investments into “safe” stocks, such as ones that pay high dividends. If you’re investing for the long term, don’t do such a thing. This past week could very well have been just a blip on the market and the rise could continue for 6 more months. Or it very well could be the beginning of a bear market. Either way, if you have a sound investment strategy that takes these ups and downs into account, just stay the course. But if the market volatility and decrease in your net worth is making you want to sell a bunch of your investment,s you might need to re-think your overall investment strategy. Or just hold on for the ride! Read this post again. You’ll thank me later. This is going to be a quick public service announcement post. Lately, I’ve been hearing a lot of talk in the media about how the market crash is coming and we need to panic. The cover of the latest issue of Fortune magazine had a guy with a sign saying “The End is Near”. The stock market WILL go down. The starting value of the S&P was 250 in 1930. The most recent valuation had the index at 2800. That’s more than a 1,000% return. Not too shabby. But as you can see in the chart, there were many dips along the way. It was a very bumpy ride and will most likely continue to be bumpy. Corrections and recessions are to be expected. Investors should not be surprised when they occur. For long term investors, market drops SHOULD NOT change behavior. When there is a market drop or recession, you will see the pundits talk about where to “shelter” your investments. The safety of bonds will be talked and written about. And you will see people panic and do very stupid things with their money. Especially with their retirement accounts. Market drops should be expected during your investment journey. If you’re investing in a 401K or IRA which you can’t touch until age 60, there is no reason a recession should spook you when you’re age 40. If anything, a market drop might compel you to increase your contributions since stocks will be cheaper. As long as you make a sound investment plan that takes market drops into account, your retirement accounts should be able to weather any recessions, which last 2 years on average. Stay the course and keep contributing to increase your shares. No, the end is not near after all. Agreed! The exciting part is the ability to buy at lower prices as compared to now. And as long as consistency is in place, the buy prices should even out in the long-term. Having said all that, I will admit that saving a little on the side in an after-tax account in the form of cash may not be a bad idea either. As Buffett says, Buy Low, Sell High! Buy low and sell high is right. But by following their emotions and panicking, many people end up buying high and selling low! 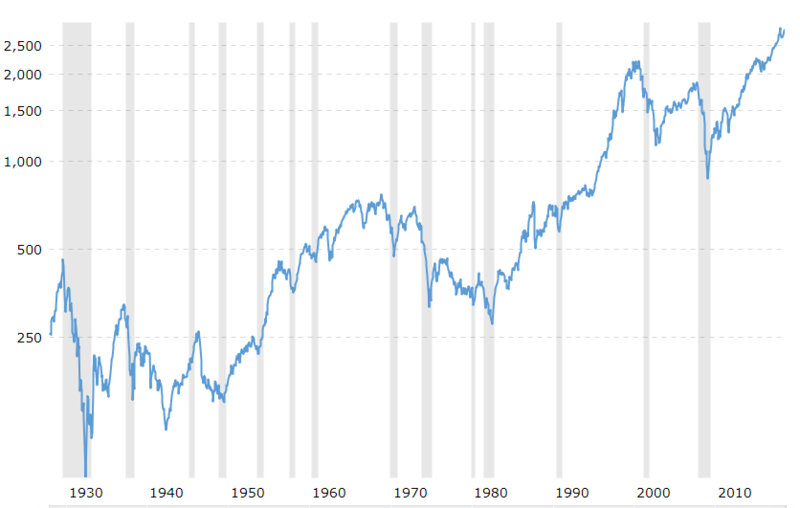 Letting the market do its thing over a period of decades will almost always make you a lot of money.